Update: The dogs are coming back on November 21st! 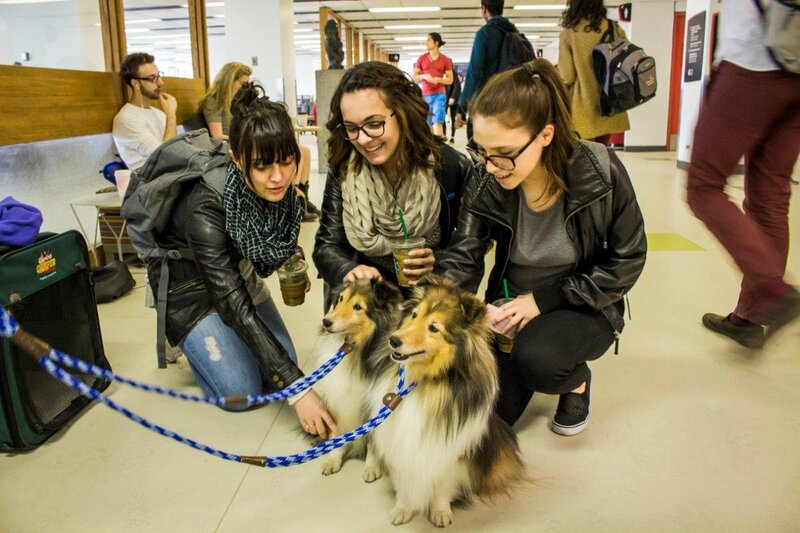 Having a ‘ruff’ time with midterms? The McGill Humanities and Social Sciences Library invites students to take a ‘paws’ with Brandy and Astra, two Shetland Sheepdogs who are part of the Blue Ribbon Therapy Dog program. 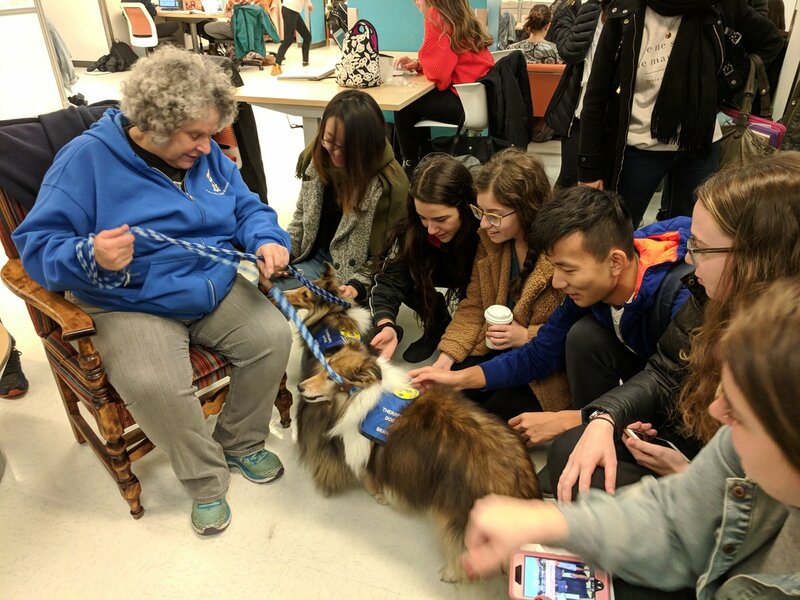 Yesterday afternoon, students stopped by the Redpath Library Building Group Zone to spend some time with the dogs to clear their heads and take a well-deserved break from studying. Harriet is happy to answer students’ questions about her dogs. 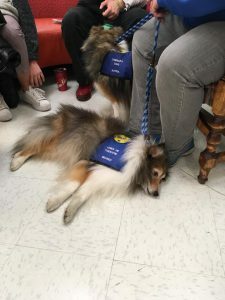 Harriet Schleifer is a co-founder of the Blue Ribbon Therapy Dog program. She has been working with Brandy, who is 14 years old, for 12 years. Astra, who is only 2 years old, is the apprentice. Harriet and Brandy have been coming to McGill for many years; visit requests from the University have skyrocketed since the program began, with other universities and cegeps catching on as well. 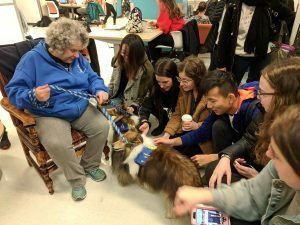 Harriet takes her dogs on visits to hospitals, nursing homes, women’s shelters and other universities. They also participate in a program where children read to dogs in order to improve their reading skills. Astra sits pretty for some treats, while Brandy enjoys some attention. 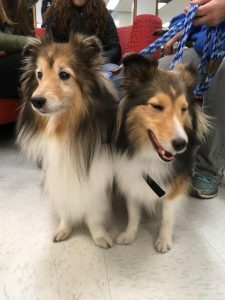 Despite their packed social schedule, Brandy and Astra will be here again next week! 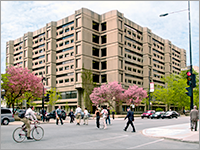 The visit will take place on November 21st from 12 to 2 pm in the Redpath Library Building Group Zone. 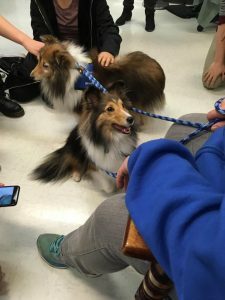 Therapy Dog visits are possible thanks to funding from the Mary H. Brown Fund! After two hours, 14-year-old Brandy is ready for a nap!